How much water do you need everyday? A question for which I kinda have an age old answer - 8 glasses!!! Its been quite some time since I posted the Fashion & Fitness Series. Read the earlier ones here, here, and here. Coming back on this post with water - H to O!!!!! The answer to the fore-mentioned question is questioned of late - Do we really need that much water? Or is that enough? What if I drink too less? What if I drink too much?!!! I realized this a lot when I moved to London. In Chennai, I go on evening jog. Early mornings before 6 is pretty much impossible for me. By 6 AM, sun rises and it gets hot very quickly. I moderate paced jog makes me sweat so much. I tried a couple of times to go on a jog by 6.30 or so, even before completing 1km I got dehydrated. So my usual timing is 6 PM after sun sets. Its impossible in Chennai to jog when sun is out!!! For those who don't know the summer weather there reaches 40ºC and the lowest in winter is around 22ºC. However things just reversed in London. The sun is hardly out. The maximum that I've felt here was about 10ºC!!!!!!!! Here I go on morning jogs and I never sweat even if I walk 9km (that's the max I did once)!!!!! Now, this made me think hard. How can there be a generalization on hydrarion requirement when I go tired in 1km in Chennai and never sweat at all here???!!!! The answer is that's its relative and not a hard & fast number. This number of 8 glasses a day is suitable to the regions with cooler climate like here in London and very less in Chennai. Also its not necessary that it has to be plain water, it could be juices (even fresh fruit) or milk/tea/coffee etc. Also it depends on how much you work out, meaning, athletes need more than sedentary people. For athletes (just working out as well), one way is to weigh themselves pre & post workout. The water that's lost in sweat needs to be replenished. There are some Hydration calculator available online, but the best is to ask you family doctor. Bothering & thinking so much about hydration, right on time, I came across these 2 brands called Aqua Carpatica & Rejuvenation Water at London Health Show. Aqua Carpatica is a brand that produces Mineral Water bottled at Transylvania's Carpathian Mountains in Romania. Since its a naturally occurring mountain water, its nitrate free and rich in minerals. They produce 3 kinds of water - Still, Sparkling & Forte. Still water is always my favourite. I dunno, but personally, after a workout, I look out for water, than energy drink or juice or anything else. I prefer the taste of pure water! This one has only 0.7mg nitrates per litre. The taste of the water was refreshing without the smell or taste of chlorine or other cleansers. The sodium content is low & has calcium & magnesium in it. The sparkling water has no nitrates at all, however not my choice. Forte is the carbonated version. The Still water is bottled at Bajenaru and sparkling water is bottled at Paltinis (I'd really want to visit these beautiful forests!). The total mineralization of still water in 300mg/l and sparkling water is 1615mg/l. Under them is also another brand, Jubi (JUicy BIrch) which produces flavoured birch water. This is manufactured in Ukraine from the birch tree using its sap. This was a refreshing drink indeed, which could replace juice or softdrinks, but not water. Its slightly heavier than water in taste & texture and it cannot be drunk a lot. This comes in 4 flavours - pure, rosehip, mint & nettle. The mint was my favourite. 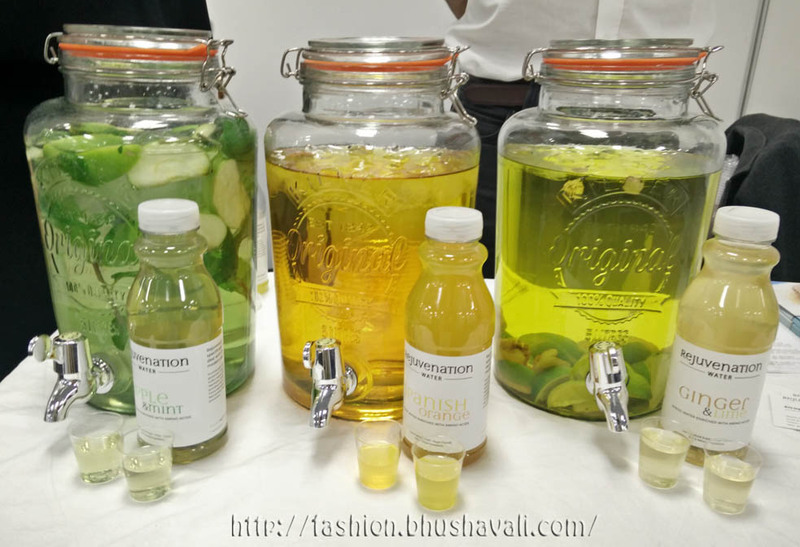 The other brand Rejuvenation Water produces infused water! Yes, there have been times, when I know that I have to hydrate but I don't want to drink plain water. Its been quite some time since I've been wanting to make infused water and here I saw this brand making it in 3 yummy flavours - Apple & Mint, Spanish Orange, Ginger & Lime. The Ginger & Lime was a it tangy and spicy, the Orange was perfectly tangy and my favourite was definitely Apple & Mint, which was mildly sweet and very mildly sour with Apple and refreshing with Mint - a very perfect combination. Enriched with amino acids, its has low natural sugar content in it. This is manufactured in the UK. I think it's best to drink just plain water because the other flavored ones must have sugar and other ingredients. Keeping the body hydrated especially when it's hot or when you're into strenuous activities is a must. I envy your cold weather. It's never consistent where I am. It's nice to keep yourself hydrated though, wherever you are in the world. Water does a lot of things to our body that no other liquid can. Great post. Very important to know this stuff. The worst feeling ever is being dehydrated or cramping up which happened to me before in basketball. Great info. Those drinks look good. I'll definitely look into them. Thanks for sharing. Keep it up! what i like about these are the bottles. they look so cute. <3 ive been making my own vitamin water at home. i love them so much. Thank you! AQUA Carpatica is one of the best water in the world. Not just the bottles are unique, but the taste and the health benefits: SODIUM FREE, VERY LOW NITRATES CONTENT, PERFECT BALANCE CA/MG. AQUA Carpatica is available from Harrods, Wholefoods, As nature intended, Tree of Life, The Health Store, Alara Organic etc. For more information please visit www.aquacarpatica.co.uk. I think we need to hydrate even on colder climates to refresh our system. I like that that Acqua can provide several variety in water, which can go for different persons. So many options now other than plain water. I know some people who can't stand plain water and I do not get it. Plain water is the best for me. I will want to try that birch sap water if given the chance. This is interesting - more water varieties. I would like to try the Birch Water. I love the packaging by the way, makes water more enticing. hydration indeed is so essential for our health. It easily shows in our body too if we're leaving hydration or not. Water is basically the answer to everything! I start my day with a cp of hot water and subsequently end up taking 8-10 glasses of water by the end of the day. No water during meals and exercise. I've been practicing this for over 5 years now and it seems to be worrying well for me! I live in cold Norway, and yes, when the temperature drops, I feel less thirsty. However, it's not good! We should always stay hydrated, no matter what the weather or temperature is. Flavored water sounds cool! And I'm no fan of carbonated water, although they love it here in Scandinavia. Awesome! Great post, love your blog !! Would you like to follow each other? That has been my problem ever since. I never drink enough water making me a bit dehydrated resulting to dry lips etc. Water with flavors are quite nice and we actually have something like this in our country, but I don't enjoy them as much as others do. I never drink enough water making me a bit dehydrated resulting to dry lips etc. although i do know that we need to always be hydrated. i need to keep in mind this post. thanks!